Louis XV ormoulu and porcelain clock depicting Apollo and the Chariot of the Sun. 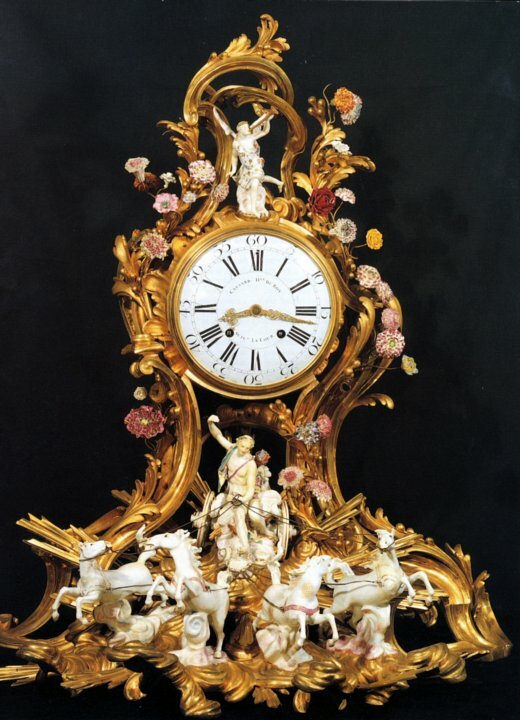 The clock, probably the largest French clock with porcelain figures, is a tour de force of design and execution. It portrays Apollo driving four horses pulling the chariot of the sun, represented by the clock’s dial, particularly apt since the sun’s movement through the sky is what a clock measures. A winged Meissen figure, Fame, seems to float above the chariot while blowing a gold trumpet, as if to announce the dawn in the guise of the goddess Aurora. The ormoulu framework for the piece is a complex of scrolls, floral motifs and abstract rococo devices, embellished with Sèvres and Vincennes flowers, and carefully chased and burnished to simulate the dazzling contrasts of light and shadow associated with the sun. The ormoulu portion supporting Apollo and his chariot is in the form of swirling flowing clouds from which straight rays of light emanate, echoing the gilded porcelain rays that issue from the porcelain clouds below his chariot. Apollo, here with his quiver, was the inventor of archery and the sun’s rays were his arrows. Certain portions of the ormoulu clouds forming the front part of the clock’s base rise, indicating perhaps that the clock was designed to sit on a dedicated marble pedestal where the carved white clouds of marble would join with the rising gold clouds of ormoulu. The white marble clouds would have seemed to reach through the ormoulu to join with the white porcelain clouds under the horses. The movement is by the great French clockmaker Edmé-Jean Causard. Ex Collection: Marie-Madeleine-Josèphe de Cusacque, the marquise de Langeac. The marquise de Langeac was the mistress of Louis Phélypeaux, comte de Saint Florentin, duc de la Vrillière (1705-1777), who served during his illustrious career as the Queen’s Chancellor, Secretary of State, Minister of the King’s House, Minister of State, Keeper of the Seals of the King’s Orders, and Member of the French Academy. He was made duc de la Vrillière in 1770. The hôtel of the Duke’s ancestor, Louis Phélypeaux, is now the headquarters of La Banque de France in Paris. The Duke’s own house, by the great architect Jean Chalgrin, still stands at the corner of the rue de Rivoli and the rue Saint-Florentin. The hôtel that the duc de la Vrillière had constructed for the marquise de Langeac, sadly, was demolished in 1842. Also built by Chalgrin, starting in 1768, it was known as the Hôtel de Langeac, and stood on the Champs-Elysées. The son of the Marquise rented the house, unfurnished, to Thomas Jefferson when Jefferson served as American Ambassador in 1785. A ceiling painting portraying a similar subject as the clock’s, The rising of the Sun with Aurora's Chariot, was painted by Jean-Simon de Berthélemy and is known to have been in the oval salon in the Hôtel de Langeac, so the subject must have been very dear to the marquise. The ceiling painting no longer exists, but the sketch for it is probably in the Musée de Beaux Arts de Quimper. It is possible that the clock sat in the adjoining oval grand antichambre on what, according to the plans, appears to be a built out area of the room that may have been a pedestal that was considered part of the architecture and built especially for the clock. Item une grande pendule le mouvement de Causard dans son cartel de bronze doré enrichi de quatre figures d’enfans, d’Apollon dans son char attelé de quatre chevaux et de la renommée, toutes les figures en porcelaine de Saxe. The clock was sold at auction as lot Nº 176 on April 2, 1778 and brought the very large price of 1200 livres.